For a town of just a few thousand people Todos Santos boasts a remarkable assembly of chefs and cooks from throughout Mexico and the world who have been inspired by the town to stay and make their contributions to Baja cuisine. The result is an incredible selection of restaurants that range from funky roadside taco carts to elegant garden dining rooms, serving everything from traditional Mexican fare to exotic Asian cuisine. No matter your tastes or budget, the Todos Santos restaurant community has something to tempt your taste buds and please your palate. This guide is divided into 7 categories, with restaurants presented in alphabetical order within each category. The sample menus shown with each restaurant are literally just a snapshot from our last visit; menu options and prices may naturally evolve over time. Check our blog for our other categories including: Killer Local Joints and Taco Stands; Charming Cafes with Great Breakfasts and More; Fun Spots with Live Music/Live Theater/Live TV; Healthy Fare, Pizza and Burgers. Overview: The Café Santa Fe is consistently hailed as one of the best restaurants in Baja and truly, every meal there is wonderful. The secret seems to be the dynamic teaming of fabulously fresh Baja ingredients, Chef Ezio Colombo’s Italian sensibilities, and co-owner Paula Colombo’s New York savvy. Lovely atmosphere with both inside and garden dining. 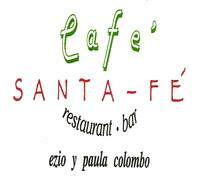 The Café Santa Fe was created by Ezio and Paula in 1990. Service. Wonderful. Most of the staff has been working there since they were teenagers and take great pride in the restaurant and in their work. English spoken. Rating: Fabulous! It’s one of our favorite spots for celebrations, and we always recommend it to our guests. Hours: Open 12:00 to 9:00 PM, every day but Tuesday. Closed September 1-October 31, 2014. Overview. Mazatlan native Chef Sergio Rivera gave up a career as executive chef on the yachts of the rich and famous to establish La Casita in Todos Santos in 2011 – and now we all get to dine like wealthy yacht owners! Chef Sergio started out serving tapas (little Spanish-style dishes) but quickly moved into entrees that feature the wonderful ingredients of Baja and his native Sinaloa. Sergio’s seafood dishes are spectacular and he now has a sushi chef who prepares a beautiful line of sushi entrees. He’s branching out into a wider variety of meats and always features fresh organic produce from local farms. Very relaxed, very charming atmosphere. To Die For: Ahi Tuna Tartar Tower, Coconut Shrimp, Pork Ribs. Just ask him to feed you if you can’t make a decision! Service: Sergio and his darling Aury are almost always on hand to greet guests and their wait staff is very helpful and attentive. Rating: Incredible! We include a meal at La Casita in almost every Todos Santos Eco Adventures week that we offer and we often have our own family and corporate celebrations here. Hours: 12:00 to 10:00 PM every day but Monday. Sunday hours 4-10 PM. Overview: Todos Santos artist and sculptor Michael Cope puts on his chef hat each weekend and what a fantastic treat for the town it is! He specializes in Asian-fusion cuisine, with some recipes coming from the family of his Japanese-American wife Pat. Everything that Michael prepares is indescribably delicious, and he cooks it up with love and flair in the open air kitchen where guests can observe. Dinner is served in the lovely sculpture garden, with numerous firepits around to keep off any chill night air. Michael’s is only open on Fridays and Saturdays and reservations are strongly suggested as the restaurant is very popular with the local community. Michael’s has been open since 2006. To Die For: Vietnamese Crab Cakes, Seared Tuna with Wasabi/Butter, and Filet Mignon with Shiitake Cream Sauce. And everything else on the menu. Seriously. Service: Michael’s wife Pat and his fellow artist Erick Ochoa take excellent care of all the guests, and Michael comes out to greet people and chat as much as his cooking demands allow. It’s a lovely experience. Rating: Fantabulous! We include a farewell dinner at Michael’s at the Gallery with many of our Todos Santos Eco Adventures gtrips, and often go there ourselves for meals with friends and family celebrations. Hours: Fridays and Saturdays, 6-9 PM. Closed during some months in the summer. Overview: Santo Vino is Hotel California Executive Chef Dany Lamote’s love letter to Baja. Chef Dany, a Congo-raised Belgian chef who came to Baja via Canada, is a long-time proponent of the slow food movement and prepares truly inspired and delicious Mexican dishes featuring the wonderful produce of Baja. Meals are best enjoyed when you ask him to pair each course with his terrific selection of Baja wines, tequilas and beers. Santo Vino dining is not just a gift to the palate but a feast for the eyes as well, with each dish beautifully presented. Housed in the same building as the Hotel California but in a completely separate space, the atmosphere of Santo Vino is warm and charming. Chef Dany is the author of The Hotel California Tequila Cookbook and also has his own line of flavoured sea salts. To Die For: Avocado Tequila Milkshake, whatever Dany recommends. Menu changes regularly so just chat with Chef Dany about what he suggests during your stay. You won’t be disappointed. Service: Very attentive, knowledgeable and helpful. Rating: Magnifico! We include a meal at Santo Vino in many of our Todos Santos Eco Adventures trips and go there regularly for meals. Hours: 7 days a week, 5-10 PM. Closed June 15-October 31, 2014. Overview: Italian Chef Angelo Dalbon and his wife Magda opened Tre Galline in 2003 and have been serving favorites from the old country to travelers seeking an alternative to Mexican fare ever since. They bought Caffe Todos Santos in 2012 and have now consolidated the two restaurants into the Caffe Todos Santos space, serving the Tre Galline menu at dinner. The place has a wonderful atmosphere with both indoor and garden dining. A nice wine list makes it all the more enjoyable. Service: Angelo and Magda make a special point of making every visitor feel welcome and well looked after. Rating: Favoloso! We don’t get to Tre Galline as often as we’d like, but thoroughly enjoy it when we do. Overview: El Gusto! 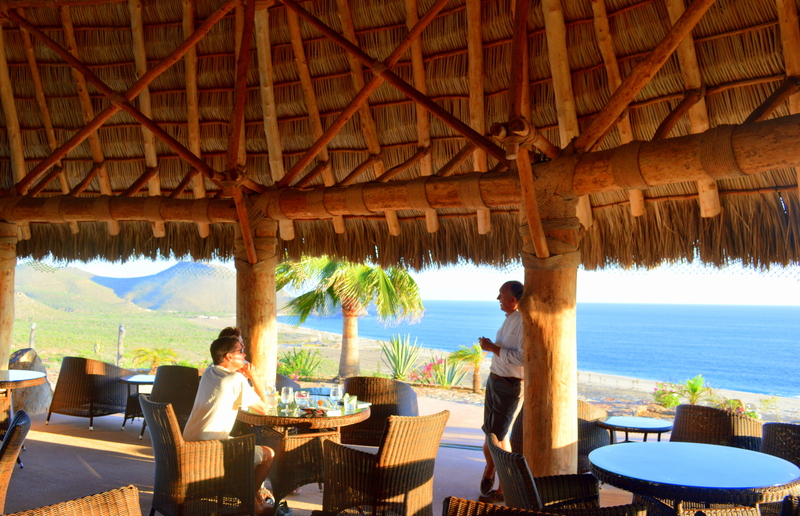 is definitely one of the most elegant dining venues in Todos Santos. The restaurant features floor-to-ceiling windows on three sides, essentially placing diners in the spectacular gardens that the owners created from scratch a decade ago. Beyond the garden you see the beautiful freshwater lagoon and its attendant bird life, as well as the ocean. Truly lovely. There is also a wonderful roof-top bar overlooking the lagoon that is perfect for a sunset margarita (great margaritas!). Swiss owner Juerg Wiesendanger mans the kitchen with Mexican and German sous chefs, producing a delightful “Swissmex” cuisine that combines the Italian, French and German sensibilities of Swiss cooking, with the ingredients and culinary concepts of Mexico. A very pleasing result for all! Hours: 11:30 AM – 9 PM daily. Closed Thursdays. Reservations only. Overview: Absolutely spectacular views so always best to plan your visit with time to enjoy the sunset. There is a very limited dinner menu each evening, but the food is generally quite good. There is frequently live music. Overview: Owner/cook Landi Ortega serves up truly delectable home-style Mexican cuisine in the laidback but beautifully elegant restaurant just off the town square. There are lovely views out over the palm oasis and if you time it right you can catch a sunset on the horizon. Landi’s father, Benito Ortega, is a famous local sculptor and some of his wonderful work is on display at the restaurant. Landi’s is a quick walk from the Sky Deck at the Guaycura Hotel, a lovely place to have a drink before or after dinner. Rating: Delicious! 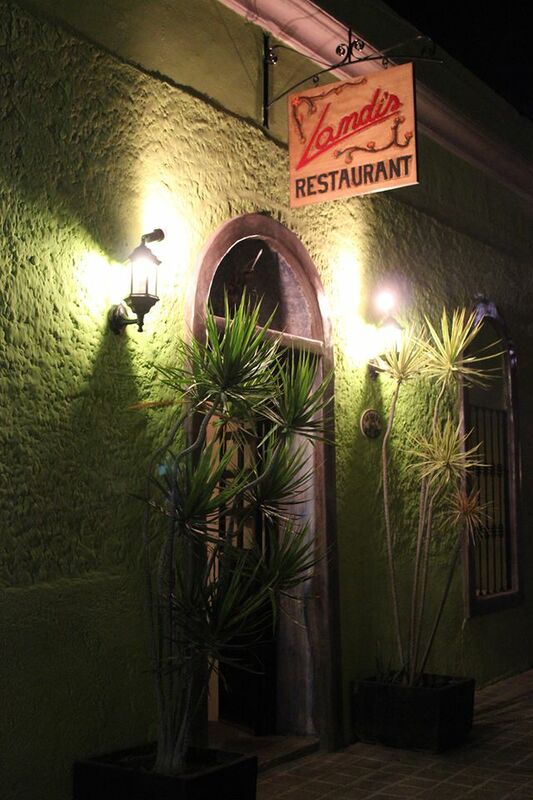 We include a meal at Landi’s in most of our Todos Santos Eco Adventures weeks and often recommend it to our guests. Hours: 9 AM – 9 PM daily. Closed Sundays. Overview: Los Adobes serves high Mexican cuisine in a lovely desert garden setting. Rating: Very nice dining experience. Hours: 11 AM – 9 PM daily. Closed Sundays. Just reading this makes me want to get on a plane and come eat! I want to eat at every one of these fine establishments! And, I like that the word is spreading about the wonderful culinary experiences to be had in Todos Santos! Come back soon Peggy – we’ve got a lot of great meals ahead of us! I have enjoyed the delights of several of these restaurants and I can’t wait to add the others to my “bucket list” for my next visit! This entry was posted on August 4, 2012 by Todos Santos Eco Adventures in Culture, Food, Travel Industry and tagged Cafe Santa Fe, Desertu, El Gusto! 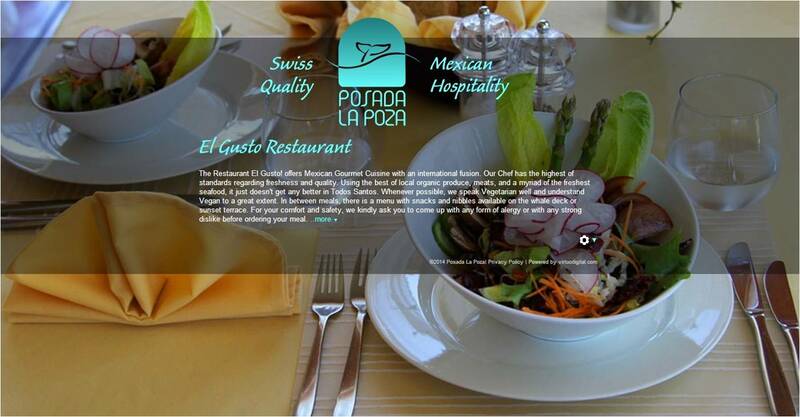 at Posada La Poza, La Casita Tapas and Wine Bar, La Copa Wine Bar, Landi's Restaurant, Los Adobes, Michael's at the Gallery, Santo Vino, Suki's, Todos Santos Restaurant Guide, Tre Galline.